Since I wrote a similar piece for pigs, I thought it only appropriate to discuss raising chickens for the table. Especially since we have recently found a breeder that supplies ‘Gourmet table birds’ for public purchase; Gourmet table birds being a heritage breed cross developed by the breeder and not the commercial broilers. We are working with this breeder and a specialist transport company to make arrangements to freight day old chicks here in coming months... So fingers crossed we are not counting our chickens before they have hatched. And you will be reading about them soon! So, what should you expect when raising chickens for the table? 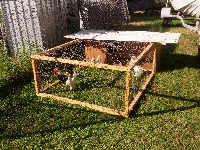 In some respects it is not that different to raising chickens as backyard layers (depending on your set up). But in other ways it is slightly. And in this respect I consider chickens to be livestock. This is often a point of discussion with smallholders etc. 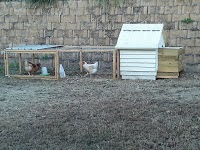 especially since you can have a couple chickens in suburbia (generally). But these are generally layers and I believe that is where the difference begins. Anyway, we generally breed Sussex and Indian Games, and then process most excess roosters and spent hens for the table. Sussex are considered a ‘dual purpose’ bird and Indian Games make substantial and tasty table birds. However raising pure breeds; particularly unsexed to begin with can prove a lengthy process, as they can take quite some time to mature. Another issue with raising flocks this way is roosters can become aggressive (especially to each other), although this isn’t generally true of Indian Games. So purchasing stock specifically for the table could be a solution. As they are to have this purpose from the outset and are reared as such from day one. With all poultry they require food, water, medication (if you wish), shelter and initially as day olds warmth and protection from the elements. 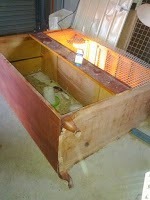 So as day olds you will need to provide a ‘brooder box’. This doesn’t have to be expensive or elaborate. For some of our first layers (we bought as day olds), we constructed a brooder using a cardboard box and a work light with a large wattage bulb. - Be aware energy efficient bulbs are meant to conserve energy by reducing the energy lost through heat. So purchasing a specialist heat lamp and bulb maybe advisable. And are generally available from pet or produce stores. Now as we incubate/breed and in this instance would be anticipating a large number. We will be using the old wardrobe we converted. - We also use a digital thermometer to monitor the internal temperature. This lets us know whether to move the lamp up or down. We also try and set the lamp up at one side, allowing the birds to move towards or away; regulating their own heat. Best line the bottom of your brooder box; old news paper or wood shavings are great. This just makes it easier to clean and maintain. But be careful not to use anything to slippery/glossy as you can cause splayed legs, something that could affect them for life. Depending on the number of birds you have and how much mess they make with their food and water will dictate how often you clean out your birds. But as a general rule of thumb I tend to change the shavings once or twice and then do a full clean out (including washing the feeders/waterers) once a week. 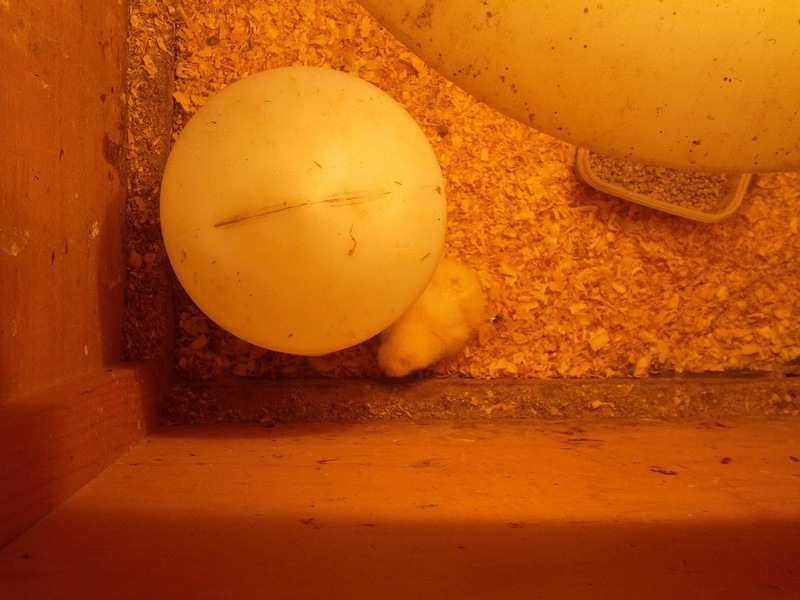 Once they have developed their second feathers (generally by 6weeks). They are usually ready to move out. This can vary on conditions and climates. I have been known to put a lamp in an outside chicken coop in winter before now! As young birds you may want to place them in a run, or tractor to begin with. This gives them time to adjust to the elements, as well as protecting them from predators. Or even other birds, if you already have other chickens (like us). Again these can be as elaborate as you like. We have constructed a number of various versions over the last 7-8 years. 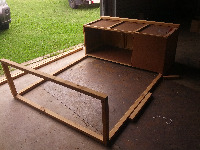 From dog houses, old cupboards to second hand swing sets. But generally the basics remain the same. You want an enclosed area that they can roost and shelter, a meshed area for them to run and experience the outdoors. Somewhere/means of dispensing food and water and for you to access that. And light enough to move. After a few days we generally begin ‘training’. Allowing the birds freedom whilst we are there and returning them to the tractor for food. This eventually just becomes an evening occurrence. Birds can be kept confined for faster meat production. This just isn’t something we do. I have already mentioned you will need a means of dispensing these. There are a variety of examples on the market for all budgets. From simple plastic ones, slightly more expensive metal ones, to the self dispensing ones. I guess what you choose depends on your set up and budget. For young chicks I do warn that larger lipped waterers can be dangerous. As we have had birds climb in, and even fall asleep in them and perish. So I always advise if purchasing a waterer aim for narrow lips. For older birds I often cut up old milk cartons and tie them the tractor mesh. And have paddling pools for free ranging stock. - It’s also good practice to dip the beaks of day old chicks into their water source when introducing them to a new environment (i.e. your brooder box). So they know where and what it is. - Water needs to topped up and changed regularly. As for what to feed your birds. As day olds the grain needs to be fine ground. You can buy chick starter from produce stores specifically for little beaks. These are also generally medicated (at least here in Australia). There are also ‘meat bird’ versions that are higher in protein. 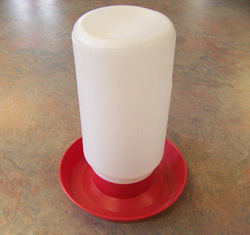 Older birds can be fed mash or pellets. Ours graze, so have access to grass and insects, and there are always those food scraps. So grains, rice, pasta, veg scraps (although onions and green potato peels are not advised) and avocado peels are toxic to all animals. Many people also do not realise you can feed chickens meat. As they naturally forage and eat bugs, protein is an essential part of their diet and makes a great ‘treat’, scrambling eggs is also acceptable. I did mention that most purchased feeds contain medication, specifically for coccidiosis. This is a disease generally associated with commercial practices as it is passed through faeces. But is fatal to young birds, so we treat all ours, ourselves with a water soluble treatment; just in case. We also worm our birds as part of our routine (generally monthly). Though this isn’t necessary until they are actually on open ground. 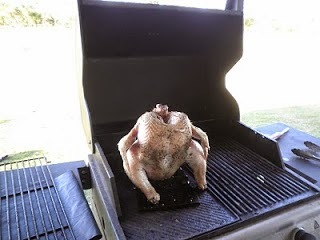 Other than that the main difference between rearing birds to be backyard chooks or roasters is the end result. 24 hours prior to ‘D-Day’ I advise securing the birds and giving them only water. This just makes the process a whole lot easier and less messy. Then there is the process of culling and butchering. Some specialist poultry butchers will offer this service, however we process our own. This is something you should consider prior to purchasing birds to rear for the table. As you have to deal with the end process. Personally as a meat eater I prefer to know the life our birds have had. And know I did the best by them. And although that responsibility can be upsetting or unsettling, it does prompt you to do the most with the end result. If you care considering a home kill there are blogs under the ‘home butchery’ tab. Including discussions about plucking and skinning.